What Jesus so profoundly demonstrates to us in his passage from death to life is that the walls between the realms are paper thin. Along the entire ray of creation, the "mansions" are interpenetrating and mutually permeable by love. The death of our physical form is not the death of our individual personhood. Our personhood remains alive and well, "hidden with Christ in God" (to use Paul's beautiful phrase in Colossians 3:3) and here and now we can draw strength from it (and him) to live our temporal lives with all the fullness of eternity. If we can simply keep our hearts wrapped around this core point, the rest of the Christian path begins to fall into place. Yes, his physical form no longer walks the planet. But if we take him at his word, that poses no disruption to intimacy if we merely learn to recognize him at that other level, just as he has modeled for his disciples during those first forty days of Eastertide. Nor has that intimacy subsided in two thousand years – at least according to the testimony of a long lineage of Christian mystics, who in a single voice proclaim that our whole universe is profoundly permeated with the presence of Christ. He surrounds, fills, holds together from top to bottom this human sphere in which we dwell. 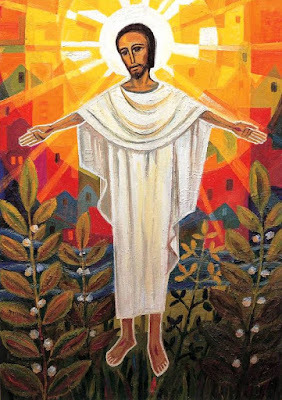 The entire cosmos has become his body, so to speak, and the blood flowing through it is his love. . . . Jesus in his ascended state is not farther removed from human beings but more intimately connected with them. He is the integral ground, the ambient wholeness within which our contingent human lives are always rooted and from which we are always receiving the help we need to keep moving ahead on the difficult walk we have to walk here. When the eye of our own heart is open and aligned within this field of perception, we recognize whom we're walking with. • "You Will See Him"
Image: Benedictine Sisters of Turvey Abbey.